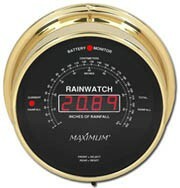 RainWatch Digital 6.5" Brass Dial Rainfall Set. With this weather dial for sale, measure rainfall to the nearest one-hundredth inch from 0.01" to 99.99". The remote self-emptying collector, of plastic and stainless steel, meets U.S. Weather Bureau specifications for accuracy. Uses 9-volt battery (not included) for memory backup. Complete 60' cable, Tipping Bucket Rain Gauge, 6.5" Solid Brass Dial and AC adapter. Collector: 8 3/4" diameter. Accuracy: +/- .01" per inch of rain. This review is more about scientific sales then the rainwatch because I have not installed the rainwatch yet. Tom is a great person to do business with because he cares about the customer and the products he is selling. If you have a problem or question he will take great care of you and that is rare in todays business climate.